Instead of spending time and money on learning PhotoShop then spinning around the countless buttons, you can use Funny Photo Maker to edit your own photos for free yet achieve fabulous photo effects you want. Funny Photo Maker is supper easy to use requiring no photo editing knowledge. Here we show you how to use Funny Photo Maker and edit photo with gorgeous funny effects for free. Interesting in photo face fun? You can have a glimpse of How to Edit Face Fun Photo For Free. Let's Start The Three-Step Photo Editing! Every common users are able to edit their own photos within seconds. Using Funny Photo Maker, you can simplify the complicated photo editing task into clicks and turn it into art work of great fun! Funny Photo Maker breaks down the whole photo editing process into 3 steps: Import, Edit, Export. 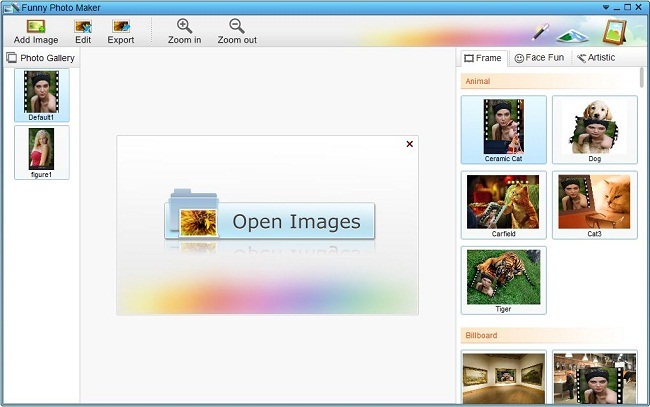 Once you open Funny Photo Maker, you will see the following interface. You can load your photos to Funny Photo Maker by clicking the picture with the words "Open Image" in it. The photos you loaded will show in the "Photo Gallery" panel. If you want to import more photos to Funny Photo Maker, please click the "Add Image" button. On the right of the interface, there are funny photo effects that available in Funny Photo Maker. Currently, all the funny photo effects are sorted into three categories: Frame, Face Fun & Artistic, offering various choices for photo frame decoration, humorous photo creation and graphic effect process. You can click the three tabs to switch them and then apply preferred funny effects to your original pictures. Besides, there are also options for customizing. These options are all above the preview panel, and they are differe from the funny photo effects categories you choose. If you feel the edited funny photo is ready for export, please click to "Export" button. It will prompt a window for setting the properties of the output funny picture you edited. 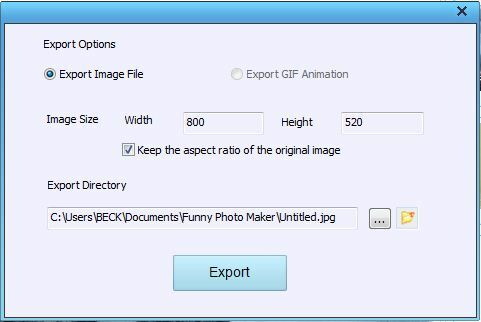 You can set its image format, size and export directory. After these settings, you can get your funny photo with a click of the "export" button.